Wilson Morningstar’s great-great grandfather, Johannes Morgerstern (1697 – 1749), immigrated to America in 1749. The St. Catharines Museum is very fortunate to have his reference certificate or Abschiedshein in the Morningstar Mill Collection. It is the most significant document about Johannes and his family’s journey from Germany to America. Johannes Morgenstern was born in Konken (Zweibrucken), Germany in 1697, and was a wool-weaver by trade. From 1737 – 1749, Johannes was a teacher and caretaker at a school church. On 9 May 1749, Johannes received a certificate of reference from the Reformed Church stating that they had accepted his resignation due to his wish to immigrate to America. The document also confirms his identity and his trustworthy and honest character. 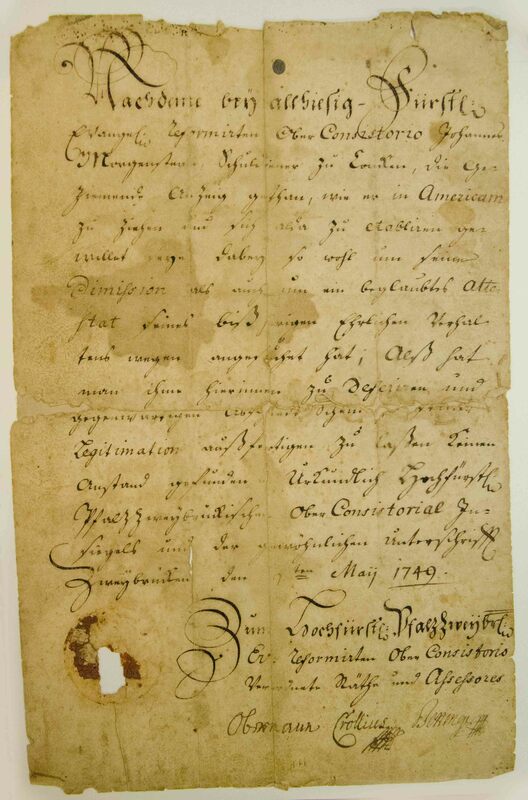 Within weeks of receiving the reference certificate, Johannes Morgenstern, his wife Anna, and two sons Johannes Jacob, 16 years old, and Johann Daniel, 12 years old, departed from Zweibrucken for the New World. Their daughter Maria, 18 years old, and son Johann Nickel, 5 years old, remained behind. The family would have traveled north down the Rhine River to Dusseldorf, Germany, then to Rotterdam, Holland. A trip down the Rhine was very expensive at the time because it was a toll river. The Morningstars would have had to make a payment at 15 – 20 custom houses along their route. In Rotterdam, emigrants typically waited between five and six weeks to roster on an Atlantic ship. As a result of the Navigation Act in 1663, a ship bound for America was required to pass a British custom house before sailing westward. Johannes and his family would have pledged allegiance to the King in Cowes or Portsmouth, England, and shown his Abschiedschein to the authorities. This type of document was required by Great Britain to insure that people who immigrated to their colonies in America were upstanding citizens. The Morningstars may have made their journey to America on the ship called ‘Leslie’. The ship was commanded by Captain J. Ballendine and sailed from Rotterdam to Philadelphia via Cowes, England. Before the ship arrived in America, it was quarantined outside of the Philadelphia harbour because many of its passengers were sick. The Captain’s register noted that 400 passengers from Palatinate, Manheim and Johannes’ hometown, Zweibrucken, in Germany were on board, but only 121 of the ship’s passengers took Oaths to the Government at the courthouse in Philadelphia on Saturday, 7 October 1749. The earliest that Morningstars would have arrived in the new world would have been early fall 1749 which gives support to the date above. Unfortunately, Johannes Morgenstern died during the voyage to the New World, and the remaining members of the family did not sign the passenger list or the Oaths upon arrival. Johannes’ widow and sons settled in Maryland and then later in Pennsylvania. In 1792, Johannes’ son, Johannes Jacob, moved his family to Willoughby Township, Lincoln County, Upper Canada and began their life in Niagara. Thank you for sharing your family research with us, Mr. Morningstar! Thank you so much for this. Johannes is my husband’s ancestor and this has been a delight to read. I am interested in the Mittleberger/Thomas Burns family connection. I wonder if the Morgensterns and Mittlebergers knew each other in PA before moving separately to Canada. Mittlebergers were living in Quebec before they went to St Catharines ca 1817. Henry Mittleberger (1802) was apprenticed to WH Merritt and his sister Henrietta married attorney Thomas Burns in the home of her aunt and uncle George Rykert and Ann Maria (Mittleberger). George morningstar later charged name to George Edward Starr I have 4 brothers and 4 sisters I am the second oldest my name is Marvin H Starr my great grandfather was a inn keeper in Oro two. Thanks so much for sharing that information! Please drop in and say hi the next time you are in the Region!